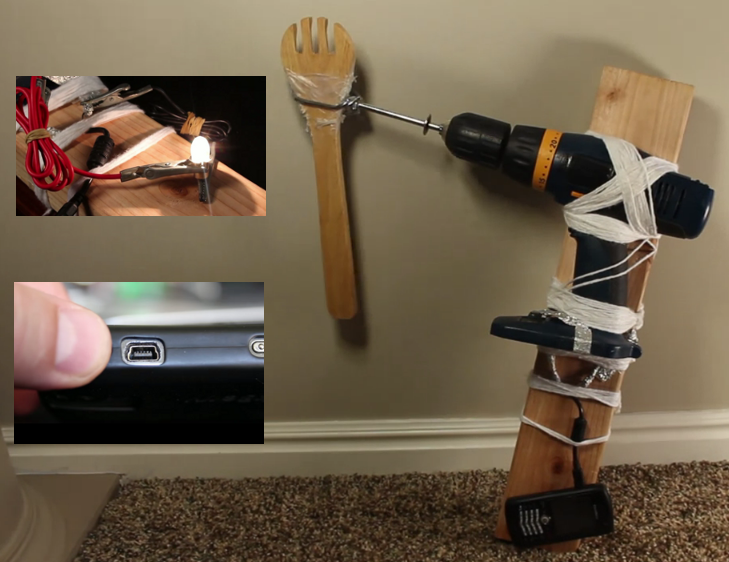 You never know when you're going to get stuck without a way to charge your cellphone (or batteries, lights, or anything else), but if you need to create a charging system in a pinch, YouTuber The King of Random shows of a simple trick to make a human powered charger using common household items. The system uses a cordless drill, some yarn, aluminum foil, a mixer beater, a wooden fork, a two-by-four, and tape to create a hand cranked generator. Basically, you're tapping the charger into where the cordless drill would usually connect to a battery, and then sending that energy to the phone when you crank the drill.